43 in 36 balls, 51 in 47 balls, 16 in 8 balls, 30 in 25 balls and 12 in 14 balls - Shikhar Dhawan has scored a total of 152 runs in 5 innings for Delhi Capitals which places him amongst the five highest run-getters of IPL XII thus far. Prima facie, his batting average of 30.4 is good. But the problem is in the number of balls he has faced in scoring these runs. Dhawan’s strike rate of 116.92 is amongst the lowest for any opener in IPL 2019 (min. 50 runs). Just for perspective, David Warner has a strike rate of 164.77, Jonny Bairstow – 167.34, Chris Gayle – 165.47, Prithvi Shaw – 158.42, Jos Buttler – 137.62, Rohit Sharma – 130.48 and Quinton de Kock – 139.02. 16 in 10 balls, 18 in 20 balls, 43 in 32 balls, 28 in 22 balls, 43 in 41 balls – Shreyas Iyer has scored a total of 148 runs in 5 innings, again at a more than decent batting average of 29.6. But yet again, it is his strike rate of 118.4 which is of concern batting at number 3. Just for perspective, these are the strike rates of other number 3 batsmen in IPL 2019: Suryakumar Yadav - 139.24, Suresh Raina – 120.23, Robin Uthappa – 136.14 and Mayank Agarwal – 146.59. If we consider a minimum of 50 runs scored, then Dhawan’s strike rate is the second-lowest after Shane Watson who is scoring at 112.73 in the tournament. If we consider a minimum of 50 runs scored, then Iyer’s strike rate is the lowest in the tournament. The problem: Dhawan and Iyer represent the same franchise – Delhi Capitals. Dhawan has faced a total of 41 dot balls while Iyer has faced a total of 33 dot balls in the 5 innings they have batted in IPL 2019. That is they haven’t scored of 31.54% and 26.4% of the balls they have faced in the tournament – that is a very high number! Let us examine the four Dhawan-Iyer partnerships this season. Against MI, they joined hands at 10 for 1 in 1.3 overs. The score was 29 for 2 in 3.4 when Iyer was dismissed. The pair scored 19 runs in 13 deliveries at a rate of 146.55. However, a Rishabh Pant blitzkrieg set the match up for Delhi. Against CSK, they joined hands at 36 for 1 in 4.3 overs (team strike rate of 133.33). By the time Iyer was dismissed the score had reached to 79 for 2 in 11.4 overs and the team strike rate had fallen to 112.86. The stand put on 43 runs in 43 deliveries at a strike rate of just 100! Delhi could only muster 147 and the target was chased down by CSK. 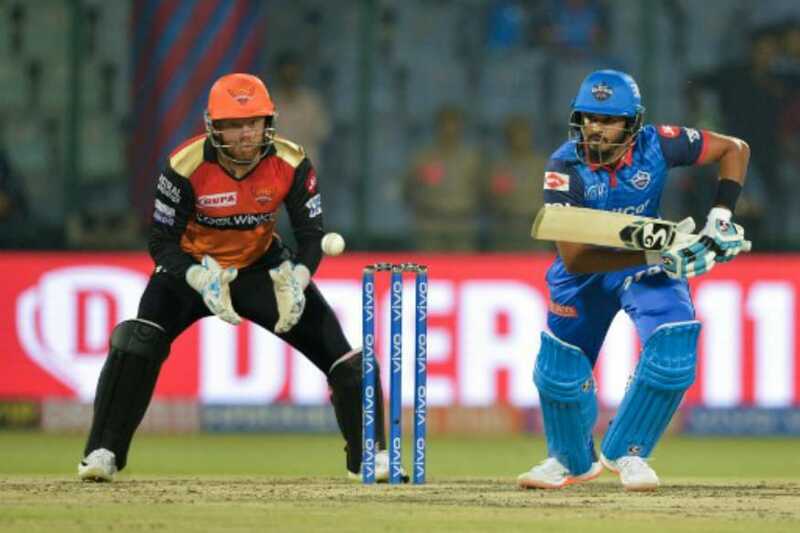 Against Kings XI, after losing Prithvi Shaw off the first ball of the innings, Dhawan and Iyer resurrected the innings and added 61 runs in 43 balls at a strike rate of 141.86. However, they both ended with strike rates of 120 and 120.27 whereas the required rate for victory was 139.17. In their last encounter with SRH in Delhi on Thursday (3rd April), they came together at 14 for 1 in 2.2 overs. The score had crawled to 36 for 2 after the powerplay when Dhawan was dismissed. The duo could add just 22 runs in as many deliveries batting inside the powerplay! They faced as many as 8 dot balls and could score only one four and a six in this phase of play. Delhi never got any momentum at the top of the order and kept losing wickets on a difficult spinner-friendly wicket and ended with an under-par 129 for 8 in their allotted 20 overs. Dhawan scored 12 off 14 deliveries while Iyer contributed 43 off 41. SRH overhauled the total with 5 wickets and 9 balls to spare. On a wicket that was aiding the spinners, the onus was on Dhawan and Iyer to attack the new ball and take a risk or two against the faster bowlers during the fielding restrictions – something they failed to do. Delhi will have to re-strategize at the top of the order. If Shaw gets out early in the innings, either one of Dhawan or Iyer would have to play the role of the aggressor. Both cannot play the role of the anchor as has been the case in the tournament. That puts too much pressure on Pant to up the ante at the death. There might also be a case to push Colin Ingram or Chris Morris at 3 just to provide that impetus at the start.